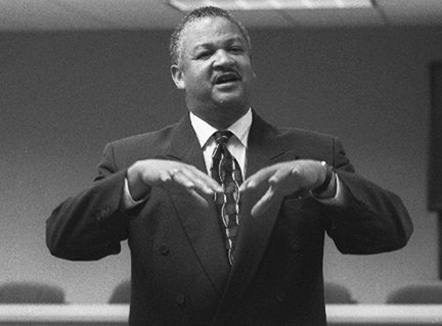 Trevor A. Hampton was the Durham Police Department’s first African-American chief of police. His major initiative was reorganizing the department to emphasize community-oriented policing, establishing a Citizens Police Academy and reactivating the Community Relations Unit. The department became nationally accredited in 1991, and Hampton oversaw the department’s transition to new police headquarters. He created a Professional Standards Division, a motorcycle squad, and a K-9 team. Although cleared of wrongdoing, Hampton resigned as chief of police after an investigation of possible perjury, obstruction of justice, and intimidation of witnesses during an internal investigation into rumors of a call-girl ring operation within the department. He believed the department, which was also cleared of wrongdoing, could be best served by a new chief who had not been receiving negative media coverage. As of 2012 the police department continues to adhere to the community-oriented service policies Hampton established.